In just over a week, a career first for celebrity chef Michael Symon becomes available to all who share his passion for cooking: his first cookbook, titled "Michael Symon's Live To Cook." The cookbook's subtitle, "Recipes and Techniques to Rock Your Kitchen," comes as no surprise. His successful background in "Iron Chef" franchises and his popular restaurants in the Cleveland area all point to his charismatic personality. As chef Bobby Flay put it, "Nobody's got a better sense of humor, and I don't know many cooks who bring more to the party than Michael. He's a great guy to hang with, and in the kitchen he's the real deal." Contributing to the cookbook is co-author Michael Ruhlman, an acclaimed food writer known for such works as the "Making Of a Chef" trilogy and his latest book, "Ratio: The Simple Codes Behind the Craft of Everyday Cooking." Here are some of the recipes that readers can find inside: beef cheek pierogies with wild mushrooms and horseradish, braised pork belly with soft polenta and seared mushrooms, or even roasted chicken with salsa verde and fennel salad. Interestingly, there aren't many dessert recipes in Symon's collection. "But I'm all about meat and vegetables," Symon commented. "I leave the desserts to real bakers and pastry chefs. Desserts aren't my strong suit." 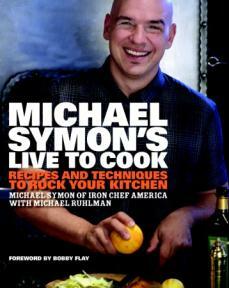 Symon's and Ruhlman's "Live to Cook: Recipes and Techniques to Rock Your Kitchen" will be available for sale on November 3, 2009, and is being released by Clarkson, Potter.